The new training facility for the Dallas Cowboys opened in November 2016. The Ford Center at The Star, located in a suburb north of downtown Dallas, is changing the paradigm for NFL training facilities. 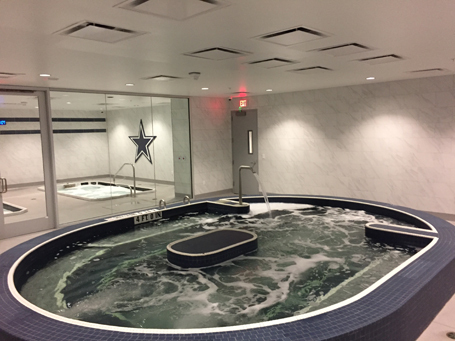 The Cowboys moved from Valley Ranch, their home since 1985, to a modern complex that’s much more than just a team headquarters and place to practice. The Star is home to the Cowboys’ offices, two outdoor practice fields and a 12,000-seat indoor stadium that will be shared with the Frisco Independent School District. It will include retail shopping and an upscale 16-story Omni hotel with a convention center. Cowboys Fit, located within The Star, is a 60,000 sq. ft luxury gym with a comprehensive list of amenities located at the Dallas Cowboys World Headquarters. Cowboys Fit is also home to the dance studio of the Dallas Cowboys Cheerleaders. The facility also includes a separate indoor 150 sq. ft. spa (exclusive to the football team), and a 2,000 sq. 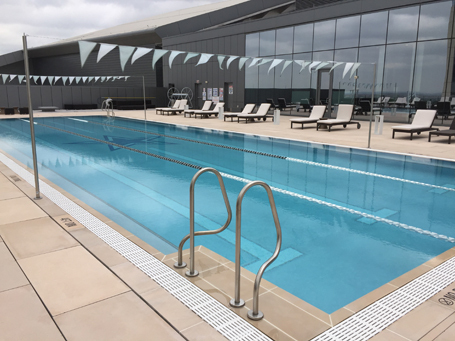 ft. heated rooftop pool consisting of three fitness lap lanes 25-yards long.